Home / A-Series / news / rumour / New Sony A-Series coming at IFA 2014? New Sony A-Series coming at IFA 2014? Sony will soon be introducing a new Walkman, resurrecting the A-Series name once again. 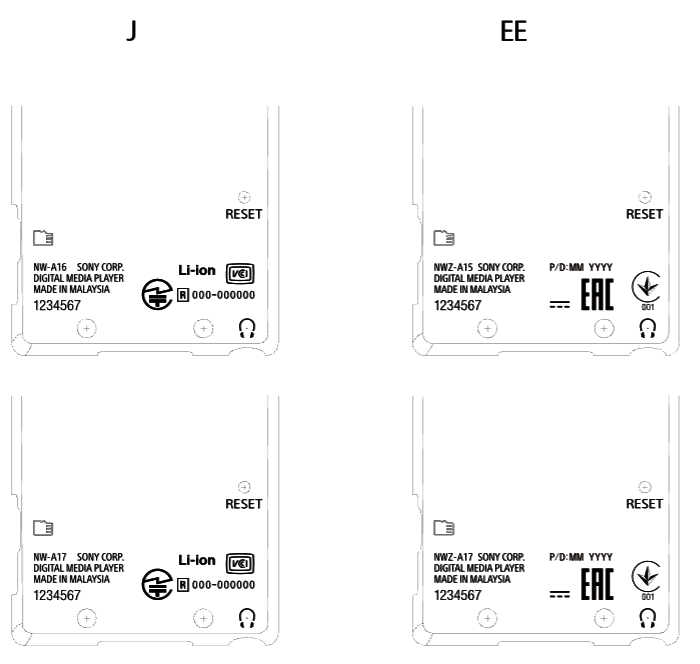 The most surprising aspect may actually be what appears to be a micro-SD card slot on the side. 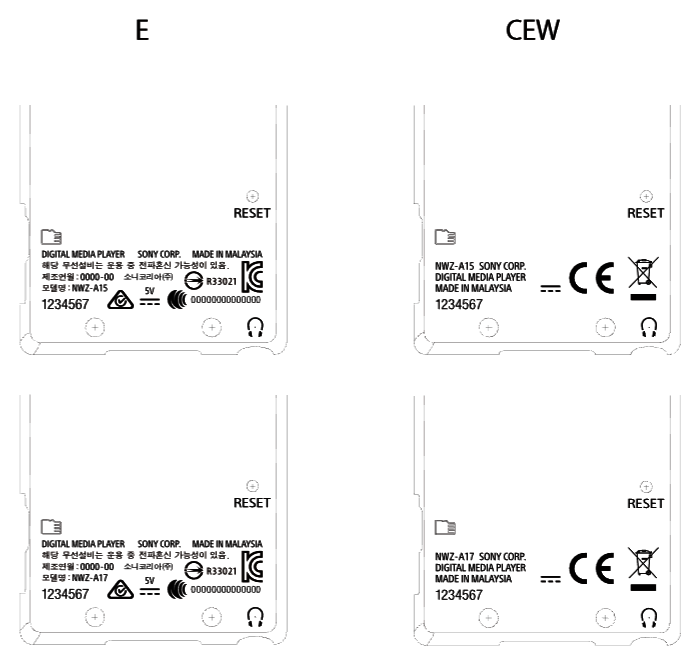 There will be 3 models, with Japan receiving the NW-A16 (32 GB) and A17 (64 GB) and the the rest of the world will have 2 models, NWZ-A15 (16 GB) and NWZ-A17 (64 GB). The device will feature both bluetooth and NFC, permitting quick connection to wireless headphones and speakers. Just like earlier with the new WS-Series, confidentiality of the FCC documents ends in early September 2014, so an IFA debut is likely, with possibly press info late August. If anyone has any more information please contact me using the form below or just post a comment. If anyone wishes to repost this on another forum, please do so but please link back to this post. Rest of info after the break. It seems not all regions will receive all models, here is the breakdown from the FCC. As seen from the image above, the CPU frequency is only 533mhz, more in line with the older A-Series, which had a 500mhz CPU from EMMA mobile by Renesas. Digging into Renesas' European site, I stumbled onto this; here is the PDF which has some details. It appears to be a cortex A9, dual core at 533mhz/core. 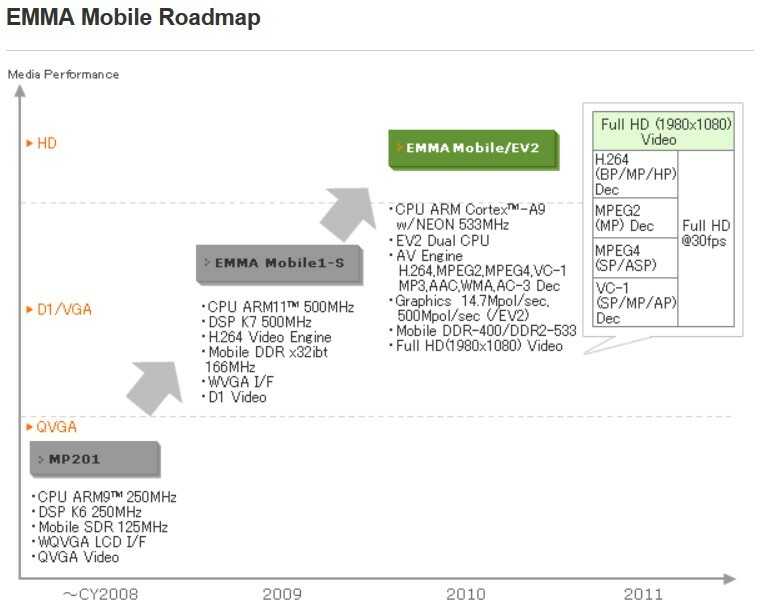 Nothing major but the previous CPUs were the EMMA Mobile1-S (A860, S760) and MP201 (X-series), so it is logical that Sony would opt for a newer gen of the same product. Even though the new EV2 has SD card support, the old EMMA Mobile1-S also had it so it seems that Sony decided to active the support this time around. I may be wrong but I feel this is the most likely CPU choice for Sony for the new A10. I feel the A10 will not run android but will come with the current Sony mp3 player OS, hopefully updated with new features like on the fly playlists. I am not sure if there will be Noise cancellation, I would hope so since the device is an A-Series but who knows. I will try to get more information. Which region represents Canada? Thank you. Most likely it is the U/CA region, so 64GB model. Do u think ZX2 will be announced at IFA as well? I wouldn't hold my breath for a ZX2 but Sony will no doubt be planning something extremely special for the Walkman 40th Anniversary. I would not expect a ZX2, since the ZX1 just went on sale in Europe early this year and at almost 700 Euros, it is a niche product so no replacement would arrive just yet. What will be interesting is how Sony decides to price the new A-series, the current F-series at 32gb is 329 euros, so clearly cannot cost that much, I would hope it is under 250 euros, if not cheaper. So should I go ahead and grab a ZX1 while it's still in the market? the lack of ZX1 availability in the US is outrageous! I might have to import one from Japan! Any chance of another F series to be announced? It seems there's a lot of life left in our beloved Walkman. I'm eager to see how this one looks and performs. I currently own a 32GB Z-1060, and I would (for the time being) consider buying a smaller set up, like this A, especially if it has a MicroSD slot. While ultimately I aim to replace the Z with a newer high-end DAP (like the ZX1, but it seems there'll be a ZX2 out before I can save the money for it! ), I'd certainly love to have something intermediate. I don't think Android is a minus; I think it's a plus. However, given the rather slow CPU (a bit disappointing? ), I agree with Ascariss that this is likely to run a Sony OS. It's this point that makes me doubtful. The Z (admittedly, with the memory almost full and quite a few apps on board) with a 1 GHZ CPU is laggy at times. Will a 533 MHZ CPU be enough for smooth performance? It seems to me that it can be so, but at the price of being limited in terms of what it can do beyond playing music. Moreover, it doesn't look like the A is going to support Hi-Res files. While I don't have much Hi-Res music, it's something that I definitely want to explore. Long live the Walkman, and thanks Ascariss for keeping this great blog! Thanks SebaE for the kind words, I will keep the blog running as long as Sony has a walkman device out there. As for hi-res file support, I am not sure, unless you found something in the FCC documents but it at this moment anything is fair game including noise cancellation. After all, it is an A-Series and they usually have much more options than the S or E.
And if it will be an A series it will be great! Post ones had OLED screen, S-master amplifier and Bluetooth! Plus decent battery life, proprietary OS (les demanding and swifter), noise cancelling and DSEE!